Chinook salmon served with sea urchin risotto, tossed greens and lemon verbena oil. In a sauce pan heat up 1 tablespoon olive oil and 1 teaspoon butter. Sweat the chopped shallot. Add the rice and then the chicken stock. Cook on medium heat and stir occasionally. In a non-stick sauté pan heat up 1 tablespoon olive oil and 1 teaspoon butter. 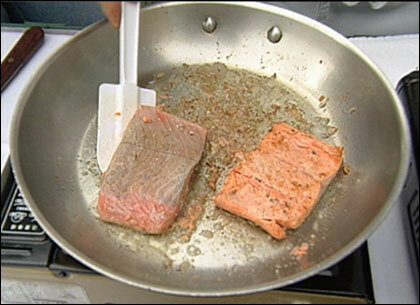 Sear the salmon fillet on medium high heat, turning frequently until done. You can also turn it once and finish it in the oven at 375°F. When the rice is just about cooked add the cream. Season with salt and pepper. At the very end add the sea urchin and stir the rice well. In a blender add 5 tablespoons olive oil to the lemon verbena and blend well. Set it aside. Toss the garden greens with olive oil and lemon juice. Season with salt and pepper. 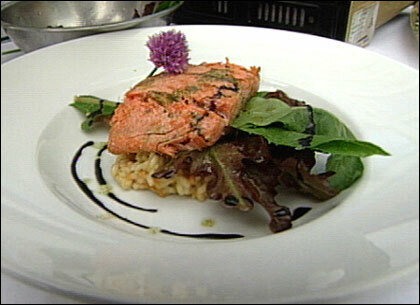 Place the risotto on a warm plate and arrange the garden greens and salmon fillet on top. Drizzle with balsamic vinegar and lemon verbena oil. This segment appears in show #2816.